Glière is generally remembered today by a handful of his works, such as the Harp Concerto, Horn Concerto, Concerto for Coloratura Soprano, incidental music to operas and ballets such as The Red Poppy and The Bronze Horseman and the Third Symphony. Between his early derivative style and his later conformity with Russian nationalism, Glière developed a unique late romantic style influenced by Wagner and by Scriabin's Poem of Ecstasy (1909). During this period he wrote the Second (1907) and Third (1909-11) Symphonies, and the Symphonic Poem "The Sirens" of 1908. The Third Symphony was published in the same year as Stravinsky's Petroushka, Sibelius' Fourth Symphony, and Schoenberg's Gurrelieder, and was dedicated to Glazunov. 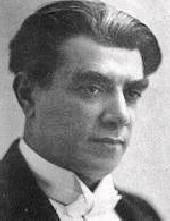 The première was in Moscow in 1912, and resulted in the award of the Glinka Prize. The work is a vast panorama of Mahlerian dimensions (the longest recording is 92 minutes), combined with heady harmonies, glowing orchestration, and long lyrical lines reminiscent of Rachmaninov. The innovative scene-painting is surely a pre-echo of Sibelius. Scoring is for quadruple woodwind, eight horns, four trumpets, four trombones, tuba, timpani, a large array of percussion, celeste, two harps and strings. The Symphony depicts in four tableaux the adventures and tragic death of the Russian hero Ilya Murometz. Ilya's lack of motion is well depicted in the extended opening. The long lines and slow heartbeat prepare us for an epic voyage. A horn call (rehearsal figure  ) pierces the mists, and the hero springs to life. He finds a horse which can fly over the land  and sets out to find the mightiest hero of them all, Svyatogor - the final approach signified by a chorale-like brass theme . Together they embark on a great adventure  - , and eventually approach an immense coffin, into which Svyatogor lays himself and dies (depicted by an eerie musical descent ). There is a solemn tribute on timpani and tam-tam . After a tender elegy  for the dead hero, Svyatogor's mighty powers are transferred to Ilya, who remounts his trusty steed and triumphantly gallops towards Kiev (pizzicato  - Ilya's theme played by eight horns ). Ilya's journey to Kiev takes him through a dense forest, evocatively pictured by swirling divisi strings. The forest is inhabited by the brigand Solovei, denoted by an ominous contrabassoon  and a triad of flutes portraying the deadly nightingale's whistle. Hearing Ilya approaching (galloping at  and Ilya's theme at ), Solovei tries his powers but in vain. Solovei begins to tempt Ilya with the lure of his three beautiful but murderous daughters bearing gold, silver and pearls. Soon  begins a long voluptuous Andante which builds inexorably to an aching climax . Suddenly Ilya realises the danger (a brass outburst ) and fires an arrow of glowing iron which wounds Solovei . Ilya ties him to the stirrup and drags him toward the Palace of Vladimir. As Ilya leaves the forest, it returns to the peaceful atmosphere of the beginning. Prince Vladimir is giving a huge feast for his nobles and the bogatyrs. Arriving at the palace gates, Ilya bids Solovei to whistle, which causes the roof of the palace to shake  and the bogatyrs to fall. Ilya cuts off Solovei's head  and Vladimir acknowledges the heroism by welcoming Ilya as a knight at the prince's table, where the merry-making resumes . The extended finale depicts two struggles of Christianity over evil - one against the Tartars and the other a twelve day battle between Ilya against Batygha the Wicked. Sinister tritones build up to a devilish fugato . As the battle proceeds, Ilya's first movement theme is heard . As the heroes sense that the battle is almost won, Vladimir's theme is heard , followed by Ilya's theme victoriously fanfared by six solo horns . The plainsong from the first movement is heard  as it becomes clear that the two pilgrims who launched Ilya on his adventure are members of a celestial band. As they multiply in strength, the bogatyrs are one by one turned to stone indicated by a tonic pedal  which is to last almost ten uninterrupted minutes. Prominent horns climb vertiginously to a primordial climax  at which Ilya himself is finally petrified. As his earthly life ebbs away, his life flashes before him with reminiscences in reverse order of all the previous movements , and the music finally settles solemnly in lushly divided strings to the home key of B minor - significantly the same final tragic notes as Tchaikovsky's Pathétique Symphony. The bogatyrs are defeated, never to be seen again in Russia, and Ilya is once again motionless. In the moments of silence which follow the symphony, the listener and player cannot be unmoved by the sheer scale of the undertaking. It is an epic journey comparable with Tolkien's literary classic The Lord of the Rings. Despite its gargantuan length, and considerable scene-painting and diversions along the way, we have been privileged to participate in a unique masterpiece.